Please refer to our stock # 9760 when inquiring. 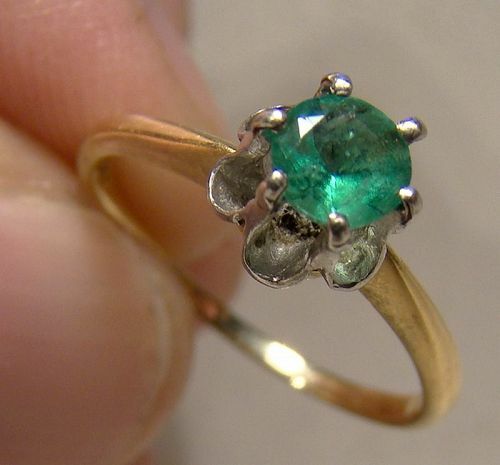 An 18k yellow gold emerald solitaire ring from the 1930s. This size 5 ring features a genuine 16 point emerald (calculated) and it sits high on white gold claws in a 1/4" setting. This ring weighs 1.8 grams, it is stamped 18K and it is in excellent condition with no chips, cracks, dents, bends, corrosion, damage or repairs. All items are thoroughly and conservatively graded and all condition issues are noted; all items are vintage or antique and may have slight signs of gentle use. Expedited tracked and insured parcel shipping to the U.S. starts at $22 (other spots may vary, air is higher). Items paid with a credit card will be shipped to confirmed addresses only. We do ship internationally. All of our prices are in $US. PLEASE NOTE: We DO NOT accept PayPal.